German chemical giant BASF opened a liaison office in Zhanjiang, a city in the western part of Guangdong province on Friday, to beef up efforts for its upcoming $10 billion project in the city and strengthen its presence in the Chinese market. 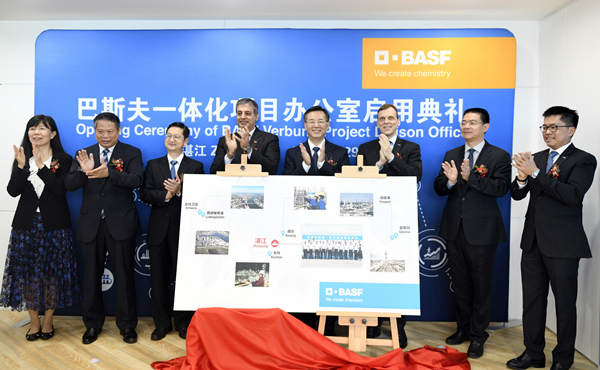 The inauguration of the new liaison office, located in Zhanjiang's Chikan district, marks a milestone in establishing a local presence to further develop and implement BASF's plans for a new, integrated chemical production site, according to a senior executive of BASF. Sanjeev Gandhi, member of the Board of Executive Directors of BASF SE, said the Zhanjiang site will offer solutions to help customers in South China manufacture high value-added products more efficiently, more sustainably, and with high quality. "We will cooperate closely with our customers, to help them benefit from BASF’s deep industry knowledge and global application expertise," said Gandhi, who is responsible for Asia-Pacific, at the opening ceremony of the new liaison office. "As a strategically important project for BASF, the liaison office will be a global model for responsible, efficient, intelligent production that brings value to the local community," Gandhi added. Last year, Guangdong signed a $10 billion project agreement with BASF to establish a new chemical base in the coastal city of Zhanjiang. In January, a framework agreement was signed to give further detail on the project, including the selected site at the Zhanjiang Economic and Technological Development Zone. When completed, the site will supply solutions for local and multinational manufacturers in South China, in industries that include automotive, construction, high-speed railway, electronics, food packaging, home and personal care, aerospace and pharmaceutical. The project will be the first large-scale Verbund site to include the full implementation of smart manufacturing.